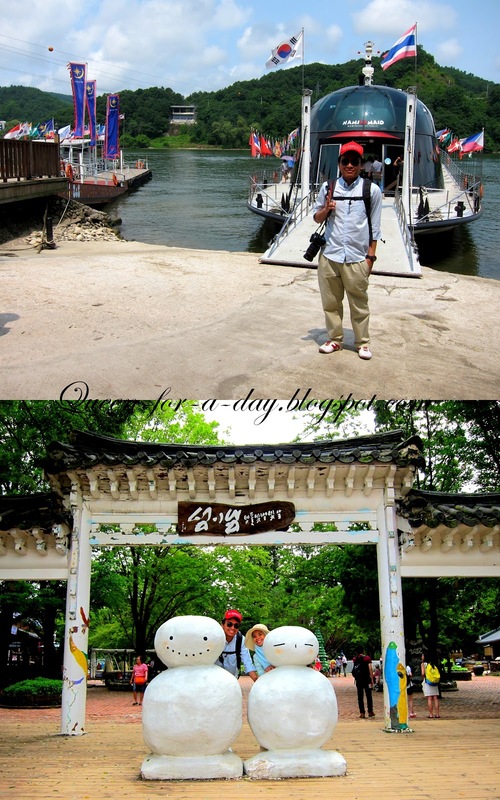 Among many places we visited in Seoul, I love Nami Island the most. In Seoul, we stayed in Sinchon. Well, I have to say that Sinchon was not a good choice to begin with. But since we planned everything in a very last minute (again! ), that's the only decent stay for honeymooners left. hehe..Although our hotel located nearby its loopline (the green metro line that goes circle), we still consider it quite far from the main attractions available to I must say...muslim! Ok, I told you we stayed in SInchon. The right way to do it is to book the ticket first, or from many blogs I read, they usually went to buy ticket a day or two before their departure date. We found the Tapgol Park and lines of buses next to it. Then we stop to catch a breath and suddenly..we noticed the bus was just in front of us!gahaha! !and the driver was looking at us panting for air! That time was 9.28am. 2 minutes before the bus departed! Anyways, for bus from Insadong to Nami Island, it is only operated once in a day. Depart at 930am and return at 4pm. That's why if we missed this one, there'll be no more. To reach Nami Island, you have to ride on the ferry. It'll take around 5 minutes. When you bought the bus ticket, you'll purchase together with the ferry ticket and the visa (to enter Nami Island, you need a separate visa. 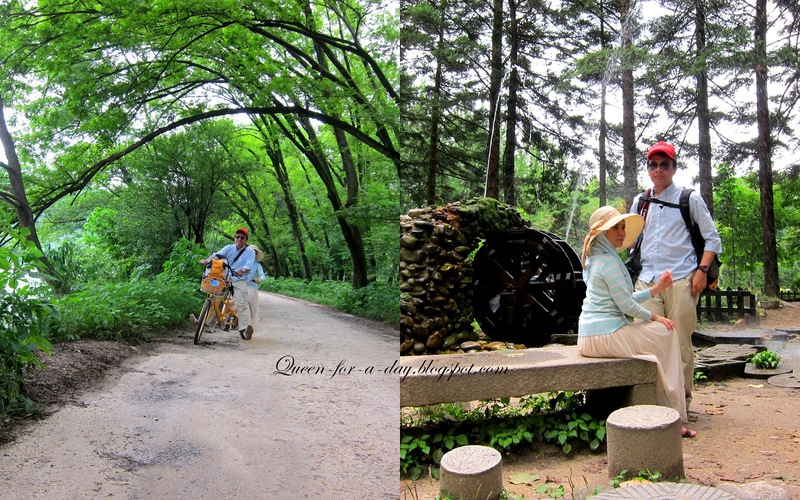 Nami Island is a different republic). But don't worry, all is taken care of as long as you take the aforementioned limousine. I'm not sure about other mechanism. How the ferry looks like. 5 minutes ride...pendek sangat. Tak rasa apa. 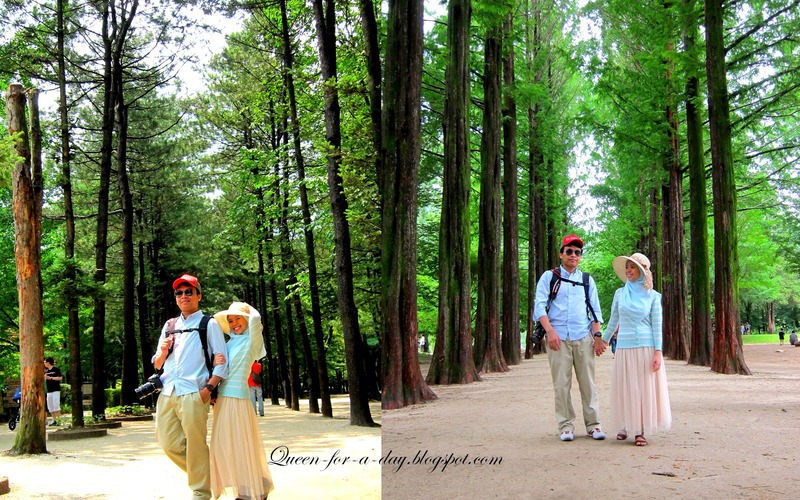 Us at Nami Island entrance. Sometimes I think this island is all about winter sonata. Everywhere there's picture of these two winter sonata cast. tsk. 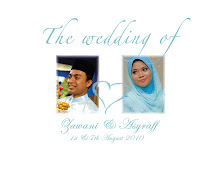 This is one of the sudut bergambar..dengan....gambar2 dr winter sonata.fuh..susah tau nak dapat giliran. We didn't even go during peak season. Imagine during peak season. phew. I'm not sure whether the conteng2 was art or simply vadalism?so many Malaysians did this!They even write together with their working place. Paling banyak puspanita. haa..sape nak jawab??haha. 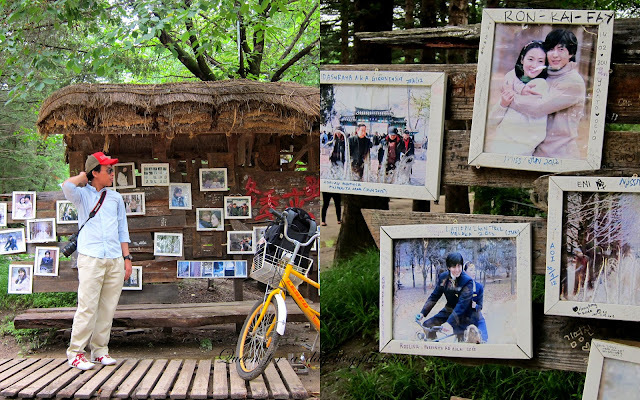 Nami island is really a hutan. So, you macam jalan-jalan dalam hutan..yang ramai orang.ngahah.